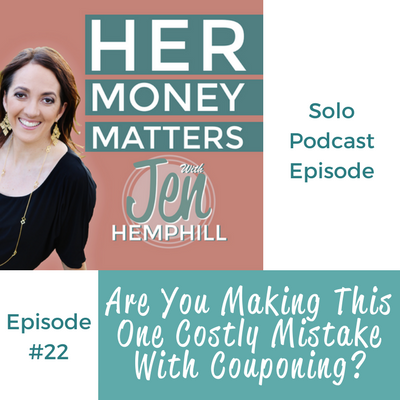 HMM 22: Are You Making This One Costly Mistake With Couponing? Couponing is a great way to save money and you can save a lot of money if done right, but there is one thing that you are most likely doing wrong with couponing. Confession: I don’t do a lot of couponing. I don’t sit down and clip coupons, I find other ways to save. I only use coupons if it is convenient–if I happen to have it and I know I’m going to need it I use it. That is just me though! You don’t need to do everything to save money, just pick a few things you enjoy and get good at it. Having said that I find a lot of people making this mistake (I have too), so I felt compelled to do this episode. Are you making this one mistake? What you can do about it with what you have in front of you right now! If you are not making this mistake and are doing something similar to what was discussed in this episode leave me a voicemail (CLICK HERE) or email me at support@jenhemphill.com. I would love to feature you and share your story on a future episode. My action step for you today: Start maximizing those coupon savings and make them work for you, don’t celebrate just the save, but celebrate the what you will be doing with that savings! You in? [00:00:27] JH: Hey there it's Jen! Welcome to another episode of the Her Money Matter Podcast. And as usual, I have a little broken record spiel or a little speech that, in my opinion, is a big necessity. And that's to say that I appreciate you being here. I know you're busy, I mean we're all busy, and you've taken time out of your busy schedule to listen to me talk and to this podcast. So it really means a lot to me. Today's topic is all about couponing and you and I know that couponing is a great way to save money, and you can save a lot of money if you're doing it right. But there's one thing that I find that many people are doing wrong, and you are most likely doing this wrong with couponing — we'll see! You'll have to tell me afterwards, alright? So I find a lot of people making this mistake, which is what I'm going to talk about in today's episode, but I'm going to share other things. So in today's episode of course, I'm going to share with you that one mistake that you are most likely making. I'm also going to share with you why it's important to take notice. I'm also going to tell you what you can do about it, and lastly I'm going to tell you one thing you do absolutely need to consider. [00:02:23] P: "I have used Jen's Jump Start Your Money mini-guide to start budgeting. I looked through the guide and also watched her video. It proves so valuable to me! I suddenly realize how many expenses I have that I do not account for monthly because simply they don't occur monthly, but annually. I started noting down all these expenses, and it helped me get a better picture of my financial situation. I can now plan for the future with more confidence. I feel I am more in charge of my money, and that I can make sensible decisions. Thank you Jen! All the best, Paula." [00:03:01] JH: So I am excited and proud of you Paola. Keep up the great work, and thank you so much for those kind words! So let's move on to why you are here with me today. We're here to talk about couponing and that one mistake. So what is that one mistake that you're making? How is making your savings from that shopping trip work for you? Is it working pretty good? So let's paint the picture here; you go, you get in the car, you go to the grocery store, you have your coupons, you know what's on sale, you buy items that are on sale, and then you maximize your savings because you're using coupons for that particular item. And let's say, in this particular shopping trip you walked away with $40 in savings. So of course naturally you walk away ecstatic, you walk away proud because heck, you just saved $40! And that's definitely something to celebrate. But my question to you is, what are you doing specifically with the $40? If you're shrugging your shoulders and saying, "I don’t know?" Or you're telling me, "But Jen, I saved $40. I mean that's what I'm doing, right?" [Laughs] Or maybe you just say, "Well, I just put it in my purse, or I don’t know? It's in the bank, right?" If any of those answers is what you answered, we need to have a talk like right this minute, and I'm so glad you're here for it! So why is this important to take notice, right? Why is this important to know what you have — if you're doing something specifically with the $40, other than just celebrating that you just saved $40. You need to put that $40 to work. You don't want to leave it in your purse, or just leave it — you know, be able to look on the receipt saying you saved $40. No! That's not going to do you any good. Yes, it's going to get used up elsewhere. And maybe not where it is needed the most. I mean think about it, so if where that $40 that you saved — or think about the last time that you saved whatever it was, amount of money, in couponing. Where is it now, right? Where is it? Do you know specifically where it went? Nine times out of 10 you don't. And I also want you to think about the last time you saved money couponing; what kind of impact did it have on your life outside of that feel-good-experience that you had with just seeing the savings on the receipt? Did it have any impact? Or is it just the happiness and being proud of saving that money? So let me ask you this; what if you could take that savings and maximize it? So that $40 or whatever it is that you save, what if you can take that and just maximize it? That's what I mean by putting it to work. So what if that $40, in this instance, could go towards your savings or towards an extra payment towards your debt, towards that splurge fund? Because hey, we ladies like to splurge, and it's quite alright. Would that really elevate your level of excitement when you see that receipt with that amount of money you saved because you say, "Oh my goodness, I'm going to take this $40 and put it towards some debt. Or this $40, I'm going to go get my nails done or my feet done." Or whatever the case may be. And that's exciting, right? I mean, absolutely! So what can you do about it? While you are in the store, this what I suggest; you want to do something about it like before you even get home, if at all possible. So while you're in the store, or before you start driving home, this is the beauty of technology. You take that smartphone out, or you open up — so you take the smartphone out, you open up the bank app, your bank app because I don't know of any bank that doesn't? There might be, but hopefully nine times out of 10 your bank is going to have an app that you have available for you on your phone. And then you're going to transfer that money that you just saved immediately, and make it work for you. What does that mean? You're going to transfer it to your savings account, you're going to transfer it towards that emergency fund that you're building, or maybe for some gift funds, for some splurge funds, travel, an extra payment on debt? You know what's best for you. You can do this, if you can't do it, maybe there's a reason you can't do it right away. Do it as soon as you get home. Get on the computer or on your phone and get this done right away. Or if you're using the cash envelope system, just put it away in one of those envelopes that serves you best, right? Really you gotta do what's best for you. Only you know that, I don't know that. But just do that because that is going to get you more excited I mean think about it, doesn't that thought of being able to do that excite you? But you're probably now thinking, "Okay, if I do this, if I transfer that money, what if I don't have enough for the rest of the month? Or what if I don't have enough to pay the bills?" Or there might be some questions coming up right now as you think through this. Even though there's excitement, but there's also some little doubt, right? Am I right? There probably is. So this is why I'm going to tell you there's one thing to consider. So if you don't set a certain amount, meaning in other words, if you don't budget certain amounts — for example in this instance it was groceries — it's not going to work as well because you don't know what your target goal is, meaning your budgeted amount or allotted amount versus what you really spent. So you really need to be clear on what you're spending, okay? So this means that you need to know how much money a month you have for groceries, how much money a month you have for all these other expenses that are in your financial picture. And of course this means knowing what money's coming in, and exactly where it's going. Not just knowing what money is coming in and it just getting spent. You need to know where it's getting spent and how much you're spending on those things. And this of course means that you need to be tracking where it's all going. So you need to be tracking your expenses, right? Not necessarily fun, but it's gotta be done. And if you haven't done this, really the very, very first step — this is the very first step before you do anything else. It's like the pre-budgeting step. You can't just create a budget without knowing these things. It's a planning step, right? And you can do this so much easier with that Jump Start Your Money mini-guide that I have mentioned, that I've mentioned in a lot of the episodes. So I'll tell you how to get your hands on it at the end of this episode. But if you're not — I wanna say this; if you aren't making this mistake and you're already maximizing your savings with, in a similar way or by how I'm telling you, I would really, really love to hear from you. Just leave me a message at JenHemphill.com/voicemail. So it will be a voice message. Or you can send me an email at support@jenhemphill.com. So I would love to feature you, I would love to give you a shout-out on one of the episodes of this podcast. And again, so you can leave me a voicemail message at JenHemphill.com/voicemail. Or you can send me an email at support@jenhemphill.com — there we go, I got it right. So let's recap the main points of the show; so we talked about that one mistake that you're most likely making, which is doing nothing with those coupon savings. And we also talked about why it's important to take notice, because you want to put that savings to work. We also discuss what you can do about it, and that's a simple step, which is taking that smartphone and transferring that money or doing it from the computer. Or if you're using the cash envelope system, taking that money and put it in another envelope. And we also talked about that one thing you absolutely need to consider. And that is if you're not clear on what your target goal is in spending, it's not going to work. Because you don't know what that target, you haven't budgeted or allotted a certain amount for certain things like groceries. So it's not going to necessarily going to work because you just don't know what you're spending, right? So you can't compare what you're spending versus what your target amount was, okay? So I have an action step for you today; I want you to start maximizing those coupon savings and make them work for you. I don't want you just to celebrate just the savings, you know, seeing that on the receipt. But I want you to celebrate what you will be doing with the savings cause that really is more exciting when you put that money to work and seeing what that money is doing for you. So if you want to have that confidence and be more in charge of your money and make sensible decisions like Paula and you haven't gotten your mini-guide, I encourage you to do so. If you're not driving and if you're in the US, you can text the word "miniguide" to 33444. Again that's the word "miniguide" to 33444. Or you can simply just go on the show notes of this episode and grab it, which would be at JenHemphill.com/22. Which is JenHemphill.com/22. So that is a wrap for today! Thank you so much for taking time out of your busy schedule to tune into the show. You can check the show notes, there's also a transcript, I don't think I mentioned that we have transcripts for the shows. And just on the show notes there's also the brief highlights and you can get that at JenHemphill.com/22. So thanks again for listening, and we'll talk again next Thursday!